St Johns Harrow » Address to the Harrow Metropolitan Police Community Carol Service – The Word Became Flesh. Address to the Harrow Metropolitan Police Community Carol Service – The Word Became Flesh. Welcome again to St John’s for what has become a landmark community event. It is good to welcome the central Harrow churches, local dignitaries, and members of other faiths to our church. My name is Barry I’m the vicar here and I love welcoming you all to this annual service, of which this is the fourth. This is a unique and special event. Until I came to Harrow I have not been part of an event quite like this. As I reflected on it this week I realised it said something, this particular service, about Christmas itself. There is so much pulling us apart at the moment Question : How many Brexit negotiators does it take to change a light bulb? Answer Whoa, whoa, whoa. I didn’t say there was a light bulb! In that context this service brings us together. The Christian message of Christmas is that when we, mankind were tearing ourselves away from God, God brought us back to him and together. And that is the essence of Christmas. (ii) is cross –denominational – Catholic, Baptists, Anglicans, Methodists and more. (ii) is our community – we have here represented the various emergency services that make our society special. I say that because in order to have, pay for and value our services, we need to hold a collective community value about the value of life. You see, we are actually proudly altruistic people; when something bad happens to someone else, we want there to be something that helps them. That intrinsic life value is central to us and our concept of God. God has made us in his image and each one of us bears His maker’s stamp. I’d like to explain why I think that is so. In one seasonal act, what has become disparate and disunited, has gathered together to become one. Here we all are together, gathered around a certain event which has its identity in one of the central facets of Christianity – the nativity and the Incarnation. Eugene Peterson Message Bible puts it this way: The Word became flesh and blood, and moved into the neighbourhood. We saw the glory with our own eyes, the one-of-a-kind glory, like Father, like Son. Generous inside and out, true from start to finish. God became man – the Word became “Flesh” . The flesh simply means our humanness, the limited finite frailty and vulnerable reality of being a human being. We can too easily come to the conclusion that we, human beings, are innately evil and bad. There’s so much to be pessimistic about concerning human nature: our tendency to hurt others, harm other selves, and destroy the very environment in which we live. We come the claim therefore that God wants nothing to do with us, or perpetually angry with us. God stays at a safe distance as if allergic to his own creation. But John says, the word became flesh – God so loves his creation, and you are his creation, that he came to be flesh. The Christian Christmas message is that in the central message of Christmas, God unreservedly affirms us. He says it is OK to be human; it is OK to be what I made you to be. Just as we affirm human life by making law to protect people, and services for those in need, so God affirms life by being incarnate, by getting involved. Jesus is a picture of God rolling his shirt sleeves up, getting stuck in! The Incarnation affirms the fact that we are God’s image and likeness – all of us – Christian, Muslim, Hindu, Buddhist, Jane, humanist or interested agnostic observer. God loves what he has made. He wants that creation to know him. God desires that we have a relationship with him. That is Christmas for Christians and we offer it as a gift to everyone else. Everything else is trapping, and decoration. Christmas is God with Us, Emmanuel. 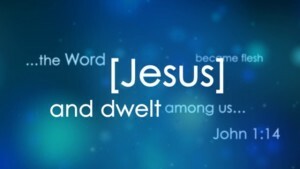 So, He dwelt among us. Actually this is translation issue – not that I know any Greek. But the original language of John uses the term, not dwelt, but to journey, in the way the tabernacle of the OT journeyed with the Israelites in the desert. “The word became flesh and came to journey with us”: says that not only does God approve of you, and love you, but he travels with us. Journeying means truly sharing the experience. He came to share the good times and the bad – he ate and drank with those he came to save. He lived, laughed and cried with his fellow man, and died as one of them too. Maybe you as a policeman, or a fireman, or a cadet, or an ambulance worker, or a councillor, or as a resident, sometimes see the negative side of human nature. Maybe sometimes you weary of the tendency of mankind to simply mess things up for himself – to become that which is anti social, anti-community, and self destructive.